Easy ribbon flowers embellished with beads come out. Black and white is selected as its main color. A very good color scheme matches your different colored outfits. 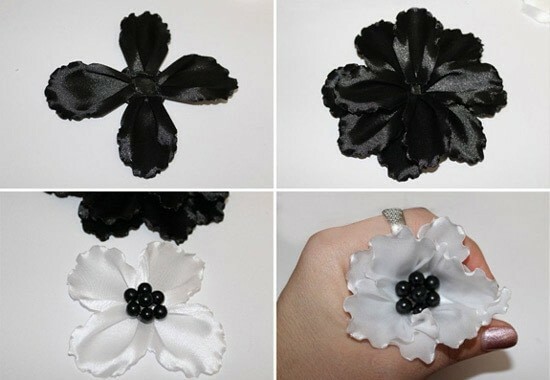 Tutorial on how to make flowers with ribbon would like to tell you how it comes step by step. When you see easy ribbon flowers at your first sight you may think it a simple piece you can handle. Actually some difficulties you will come across during your practice on how to make flowers with ribbon. Yet it is very worthwhile to concentrate all your energies on getting this marvelous ornament. 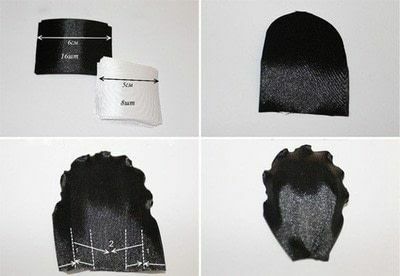 Cut out several pieces of 5cm by 16mm black ribbon rectangle and 5cm by 8mm white ribbon rectangle. Trim one end of black rectangle; a puff rectangle is done. Flame the edges of the petal go and forth to make them curl up by lighter. Fold the two sides of the petal as the pic shows and secure it with glue. Lay the circle felt as flower base, glue the black folded petal to the base until the flower looks like full; then do the same to the white petal, add black beads as flower heart by sewing. 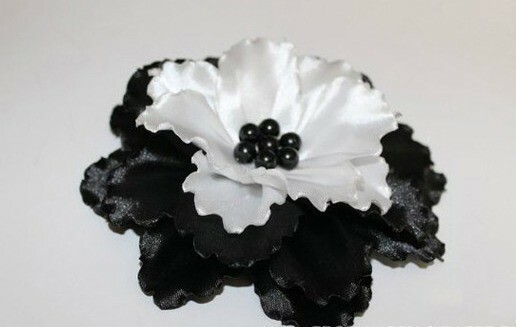 Glue the white flower to the black flower base, and then easy ribbon flowers embellished with beads come out.